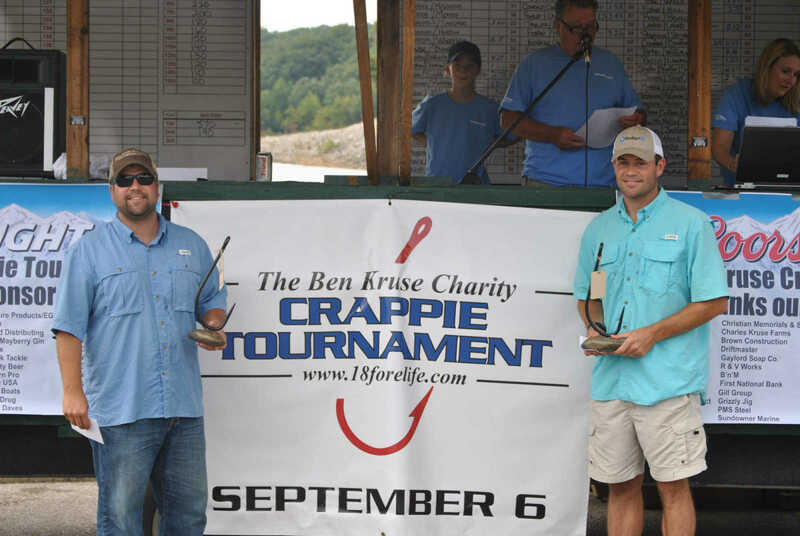 $20,500 raised for 18 Fore Life through annual fishing tournament By NOREEN HYSLOP Managing Editor Perfect weather conditions and a record number of participants paired up for the biggest and best-ever Ben Kruse Charity Crappie Tournament to benefit 18 Fore Life at Lake Wappapello on Saturday, Sept. 6. A total of 77 boats entered the contest this year -- more than any previous year. At the end of the day, a total of $20,500 was raised for the local charity, which gives $1,000 love offerings to individuals facing the challenges that accompany a cancer diagnosis. The team of Scott Northern and Frank Sifford turned in the highest weight of fish -- 6.52 lbs, with David and Wes Howard earning second place with 6.22 lbs. Along with the winners, two $25 gift cards were presented to the team that had the lowest weight that weighed in. Those winners were Brody Roper and Brandon Miller. Several other prizes were awarded and included the following: * Brett Roper won the 1199 Hummingbird raffle * Dan Hudgens won the 50/50 raffle * Amber Duley won the Cooler/Drink Card Play * Ryan Duley won the Traeger Grill * Jerry Worth won the Cajun Fish Fryer "Several door prizes were given to participating anglers and the goody bags were stuffed full of tee shirts, half-zip pullovers, towels, can coolies, stickers, tackle and more from all our wonderful sponsors," said organizer Amy Christian of the event. Tyson Foods supplied chicken wings and the team of Doug Cox, Dallas Buchanan, James Kauffman, and R.D. Stewart manned the grill. Christian extended a special thanks to all anglers, sponsors and volunteers. "We couldn't make this happen without each and every one of them, and we're grateful for them all." Next year is already scheduled for Saturday, Sept. 12, 2015. 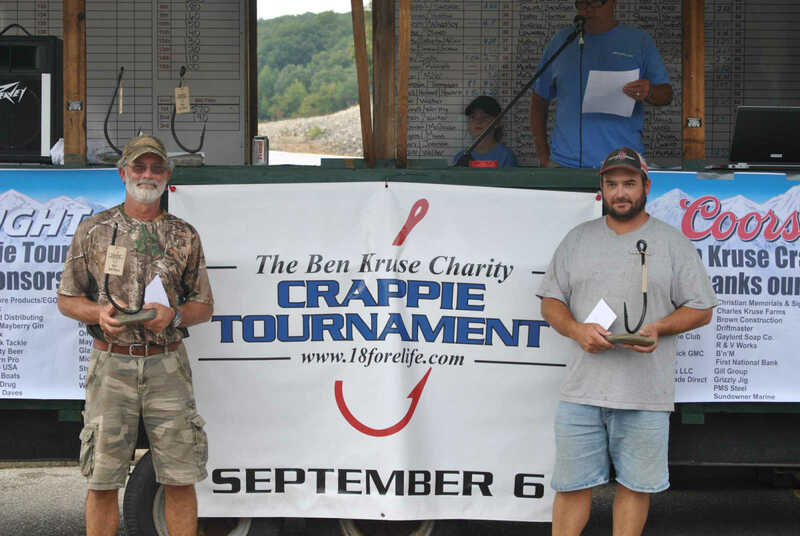 Taking first place at the Annual Ben Kruse Charity Crappie Tournament were Frank Sifford and Scott Northern. Teams turned in their best seven fish from the day's catch and vied for the highest weight. Sifford and Northern's catch weighed in at 6.52 lbs. for the first place win. The team of David Howard and Wes Howard, at right, took second place honors. Their fish weighed in at 6.22 lbs. The team of Allen Chappell and Jason Sandage placed third at the fishing tournament held Sept. 6 at Lake Wappapello. Their seven fish weighed in at 5.6 lbs. 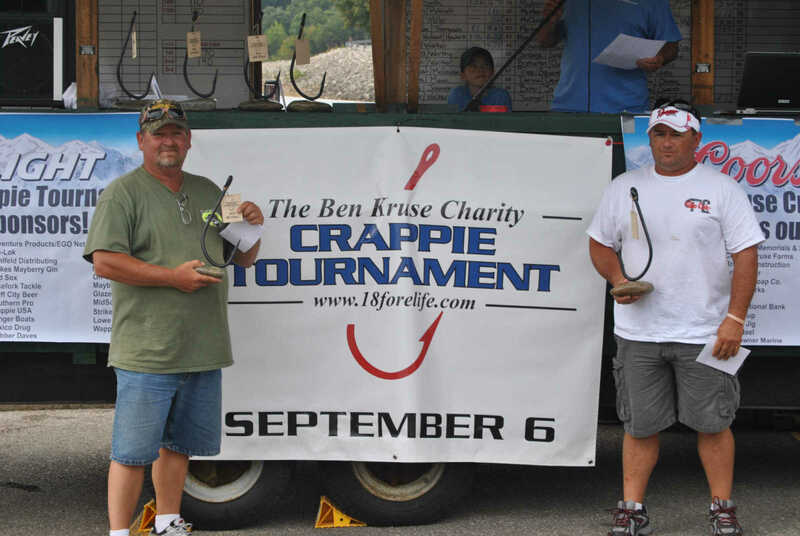 The Ben Kruse Charity Crappie Tournament has evolved into the largest fishing tournament to take place at the lake. This year's contest included 77 teams. 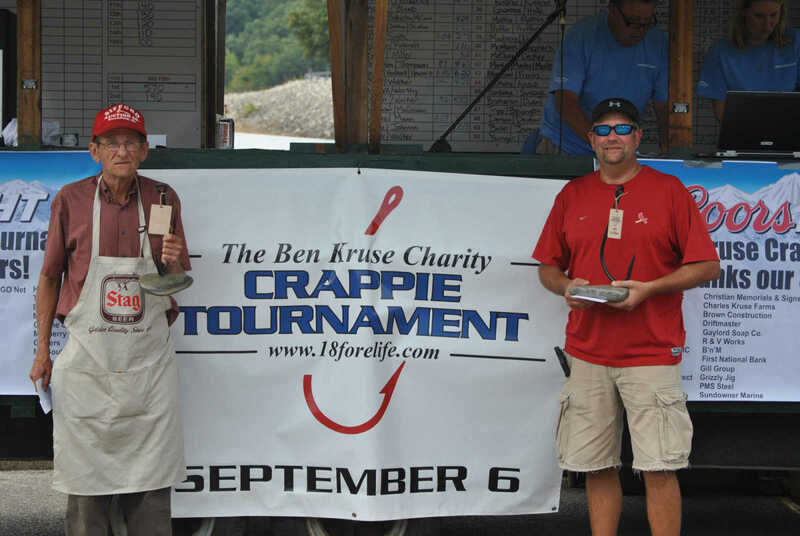 David Maddux and Jeff Riddle, pictured at right, took fourth place at the crappie tournement. The team's seven crappie weighed in at 5.53 lbs. A host of sponsors helped make the tournament possible in their third year running. Thanks was extended to Tyson Foods for supplying chicken wings for all attending the tournament. Preparing the chicken were Doug Cox, Dallas Buchanan, James Kauffman and R.D. Stewart. 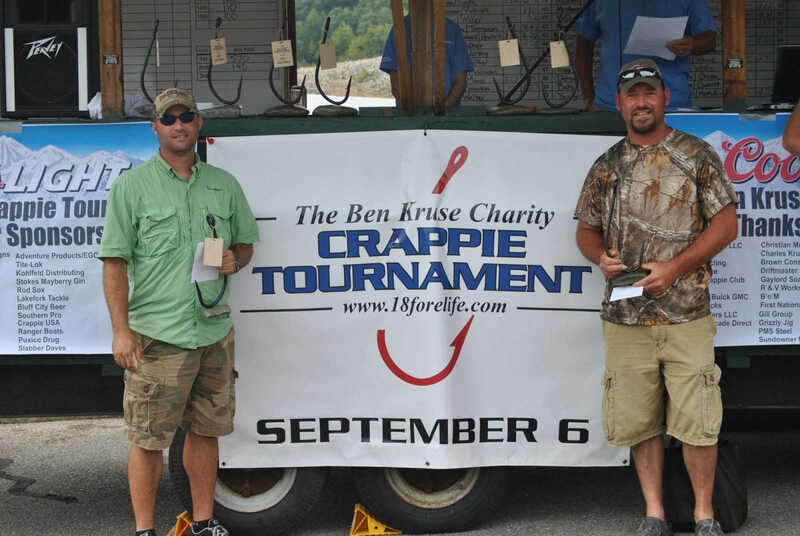 Fifth place winners in the Third Annual Ben Kruse Charity CrappieTournament were Brad Botsch and Danny Walker. The two turned in seven fish weighing a total of 5.52 lbs. Next year's tournament is already slated and will take place on Saturday, Sept. 12.